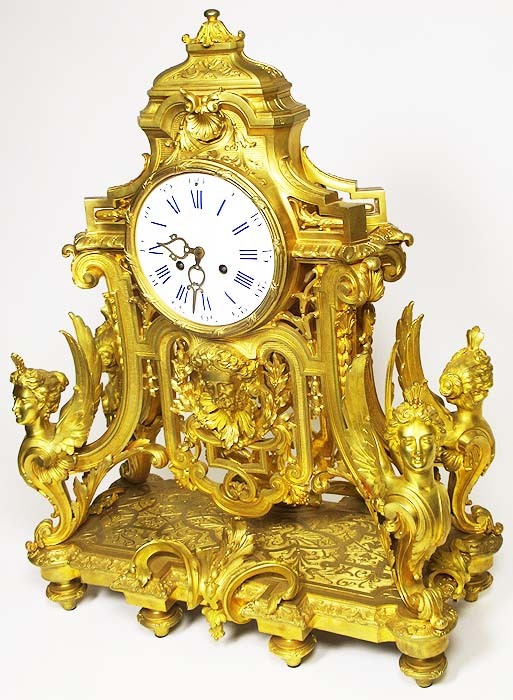 A Very Fine and Palatial French 19th century Louis XIV Style Figural Ormolu Three-Piece Clock and Candelabra Garniture Suite, comprising of a gilt-bronze clock and a pair of ten-light candelabra. 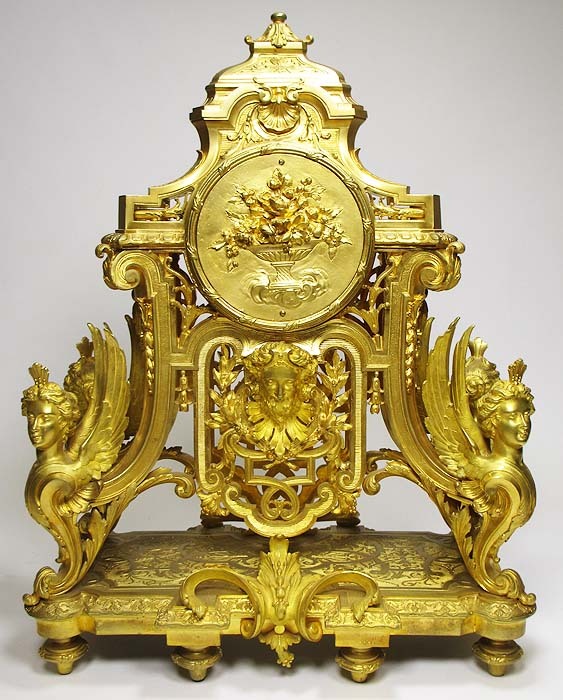 The finely chased gilt-bronze clock with a domed top, the enamel dial signed Raingo Frers/Paris, the twin-train movement with countwheel strike on a bell, on four scrolled supports terminating with winged sphinx monopodia, the front and back with pierced foliate decoration centered by a mask, on a shaped rectangular foliate-cast base and toupie feet; the candelabra conforming also with winged sphinxes and each with ten scrolled branches. 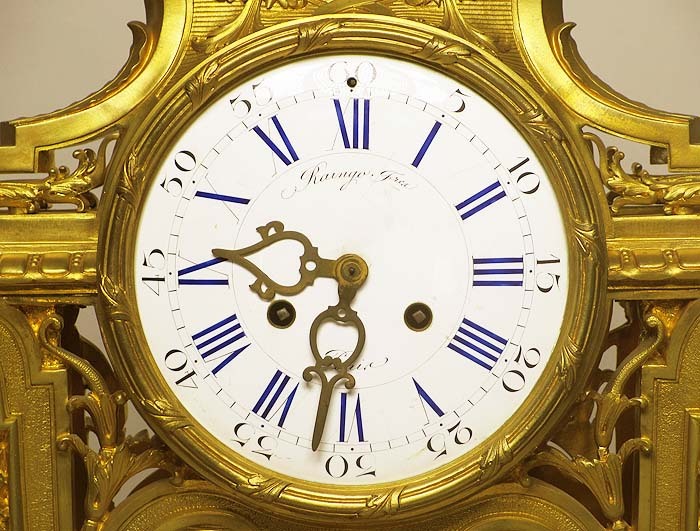 The clock case bearing a stamp to the underside "MASSELOTTE" and number 3358, the enamel dial signed Raingo Frers. Paris. Circa: Paris, 1880. 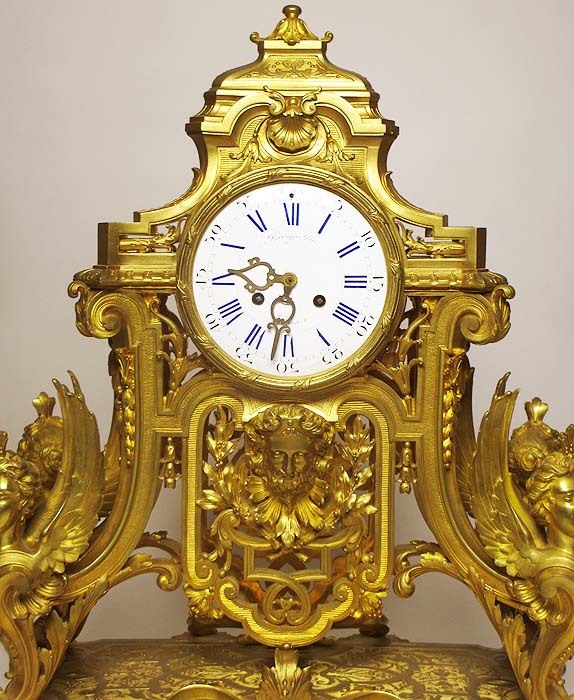 The renown Parisian Firm Raingo Frères was one of the better established bronziers and clockmakers of the 19th century. 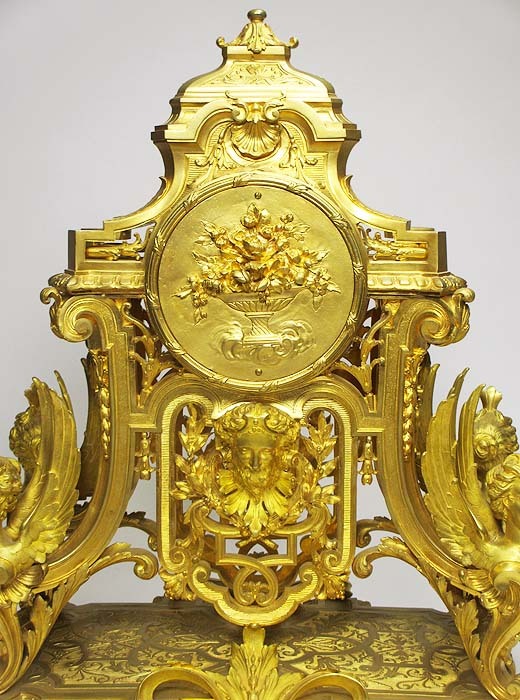 The business was founded in 1813 and established at 8 rue de la Touraine by 1830. 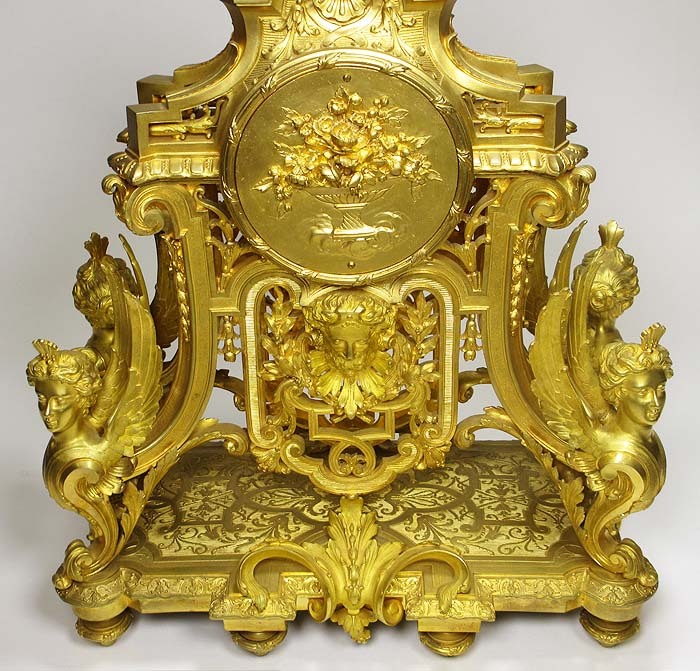 Around 1860 they carried out work for Napoleon III and the Empress Eugénie. 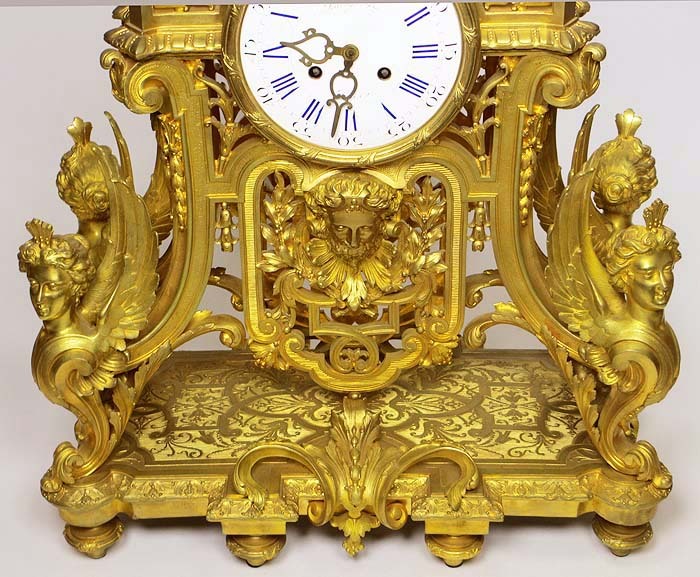 As well as making clocks and clock cases in their own right, they acted as fondeurs for a number of important artists, amongst them Pradier, Carrier-Belleuse and August Moreau. 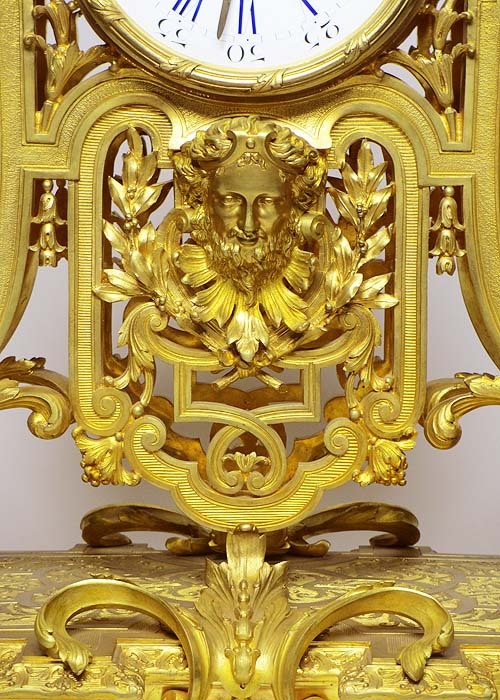 The design of the winged term-figures are after the design for the mounts on a pair of commodes supplied by André-Charles Boulle (French, 1642-1732) for the bedchamber of Louis XIV at the Grand Trianon in 1708. 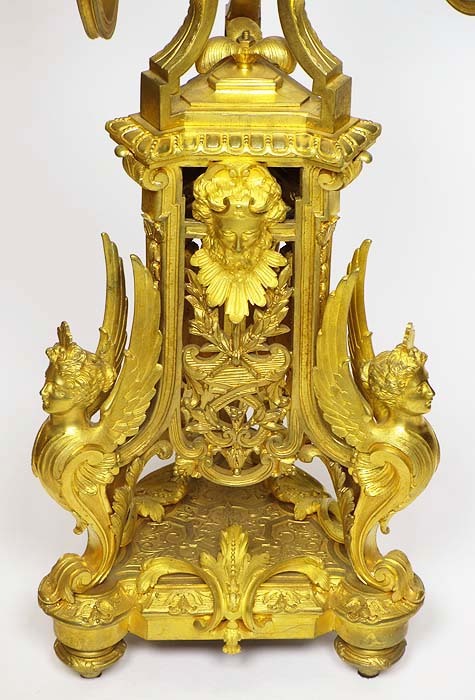 For illustrations of the 18th century models, see Alexander Pradère, French Furniture Makers, London: Sotheby's Publications, 1989, pp. 72, 82, 83, figs. 17, 35, 36. 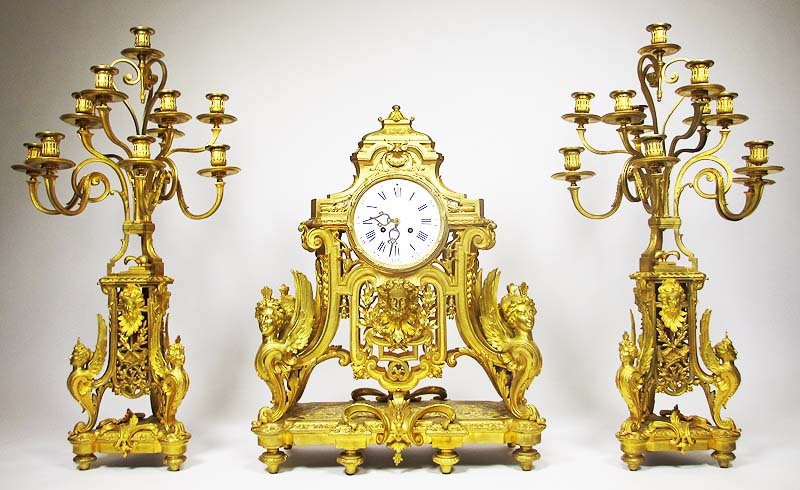 A Very Fine and Palatial French 19th century Louis XIV Style Figural Ormolu Three-Piece Clock and Candelabra Garniture Suite, comprising of a gilt-bronze clock and a pair of ten-light candelabra. 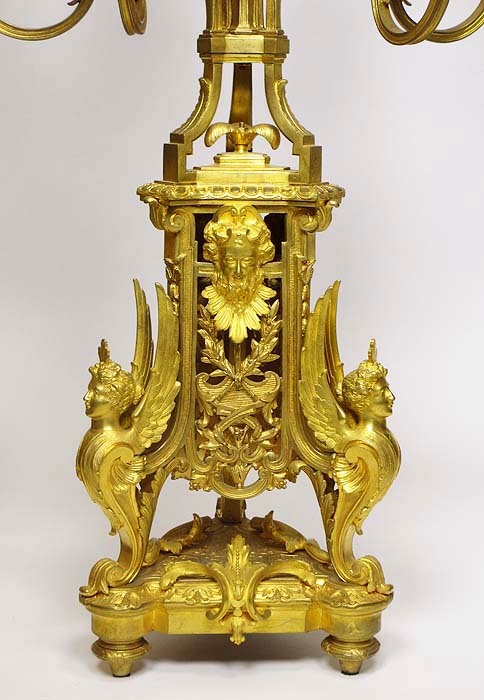 The finely chased gilt-bronze clock with a domed top, the enamel dial signed Raingo Frers/Paris, the twin-train movement with countwheel strike on a bell, on four scrolled supports terminating with winged sphinx monopodia, the front and back with pierced foliate decoration centered by a mask, on a shaped rectangular foliate-cast base and toupie feet; the candelabra conforming also with winged sphinxes and each with ten scrolled branches. 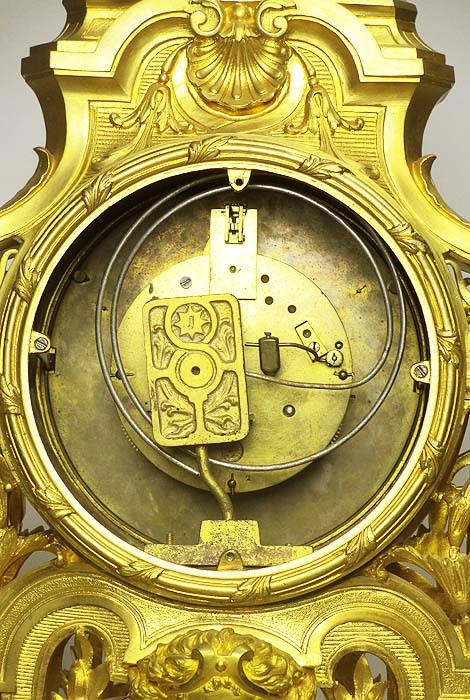 The clock case bearing a stamp to the underside "MASSELOTTE" and number 3358, the enamel dial signed Raingo Frers. Paris. Circa: Paris, 1880. 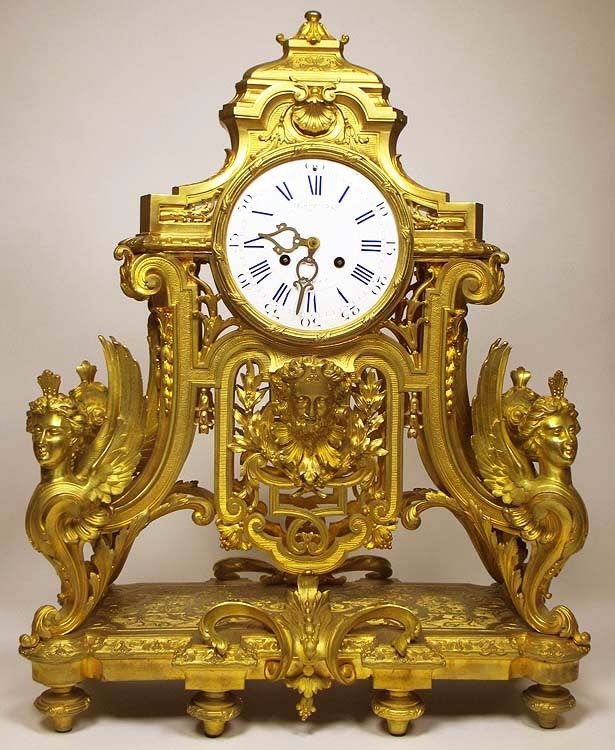 The renown Parisian Firm Raingo Frères was one of the better established bronziers and clockmakers of the 19th century. 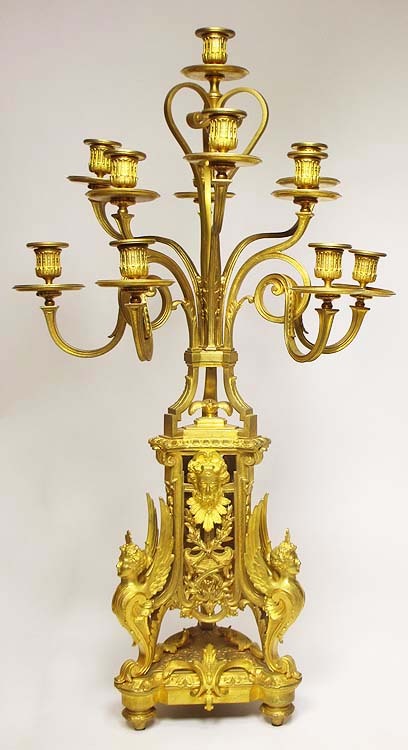 The business was founded in 1813 and established at 8 rue de la Touraine by 1830. 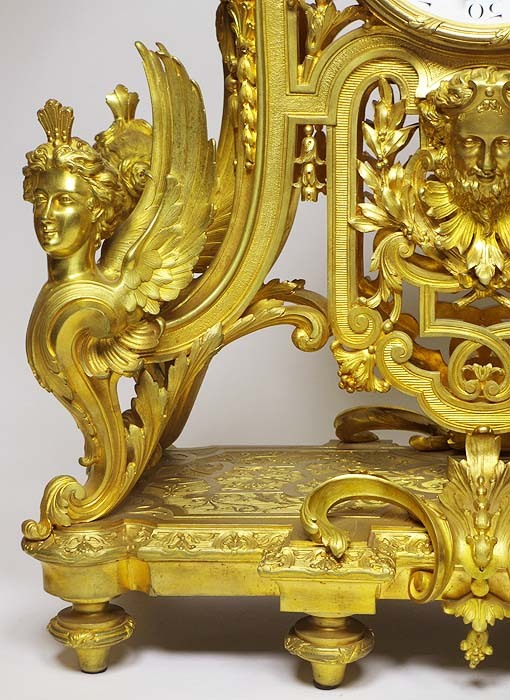 Around 1860 they carried out work for Napoleon III and the Empress Eugénie. 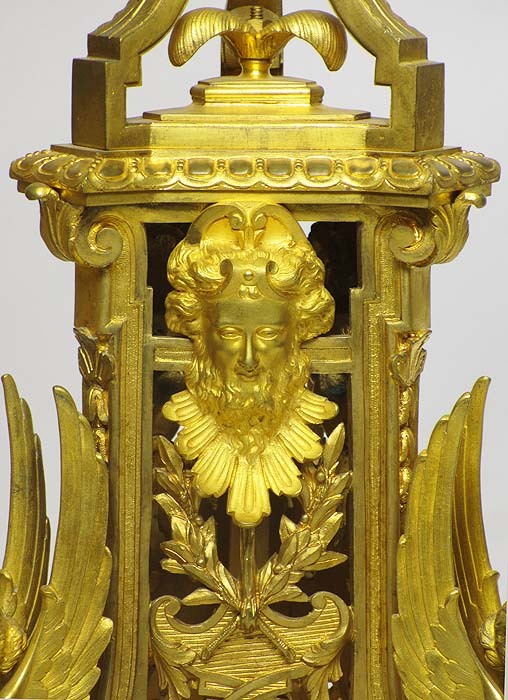 As well as making clocks and clock cases in their own right, they acted as fondeurs for a number of important artists, amongst them Pradier, Carrier-Belleuse and August Moreau. 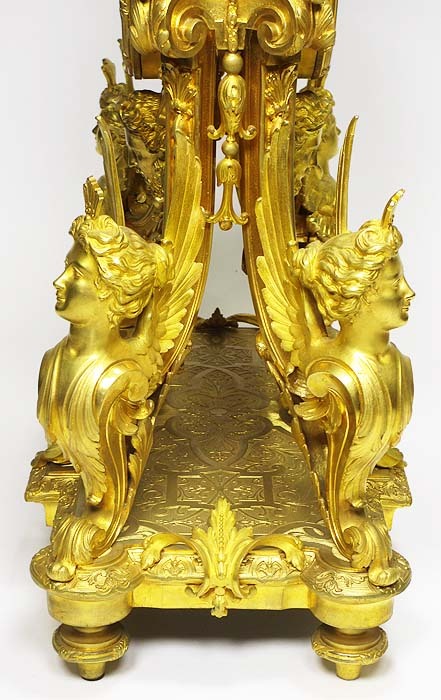 The design of the winged term-figures are after the design for the mounts on a pair of commodes supplied by André-Charles Boulle (French, 1642-1732) for the bedchamber of Louis XIV at the Grand Trianon in 1708. 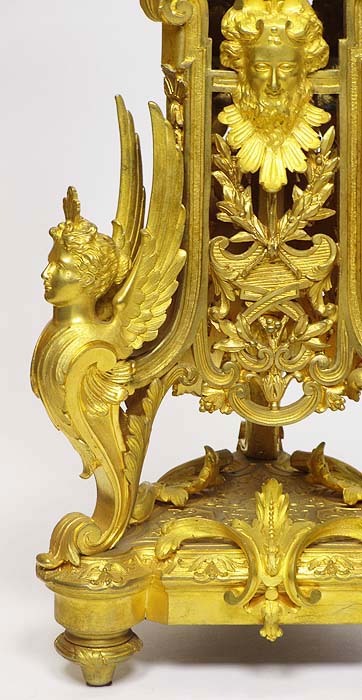 For illustrations of the 18th century models, see Alexander Pradère, French Furniture Makers, London: Sotheby's Publications, 1989, pp. 72, 82, 83, figs. 17, 35, 36.